While we may not have ALL the comforts of home on the JR, great effort is made to make sure participants don’t miss out on things just because we are at sea. 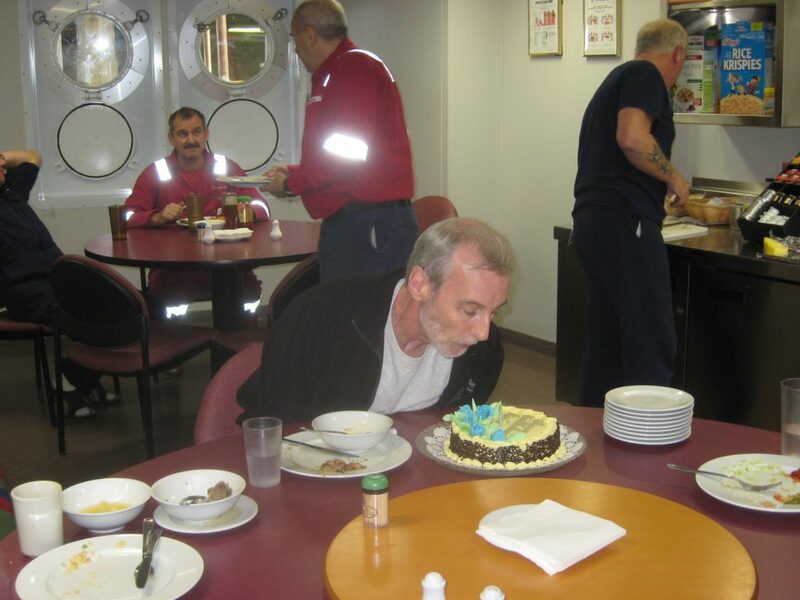 For example, when someone on the ship celebrates a birthday, the chefs make a wonderful birthday cake and everyone sings Happy Birthday. One of our Co-Chiefs, Craig Fulthorpe, had a birthday yesterday and you can see him blowing out the candle on the cake. Everyone acknowledges your special day. And you’ve probably seen my blog and pictures on Facebook about our amazing Thanksgiving feast. While we might miss our families at times like birthdays and holidays, we are building an extended network of friends on board. Remember that old song about making new friends, but keeping the old? I think lots of new friendships are forged on the JR. The experienced folks on board like the crew and the scientists who have sailed before make it a point to help us “newbies” with the ins and outs of shipboard life and the entire experience. They are very patient with all my questions, which is so appreciated!